Figure 1: Surface presentation of the structure of the palindromic titin/telethonin/titin complex. 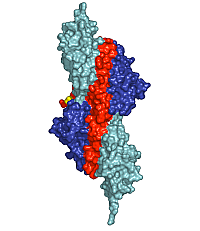 Colour codes: titin IG-like domains, blue and cyan; telethonin, red and green. Figure 2: Model outlining the involvement of the titin/telethonin complex in the architecture of the sarcomeric Z-disk. Titin filaments are assembled by a dual Z-disk bridging system, by α-actinin rods on a variable number of titin Z-repeats (three bridges are shown), and by telethonin via the N-terminal IG domains Z1 and Z2. The titin N-terminus/telethonin complex forms a core that interacts with several ligands both inside and outside the sarcomeric Z-disk. 1EMBL-Hamburg c/o DESY, Notkeststrasse 85, D-22603 Hamburg, Germany. 2Institute of Physical Chemistry, National Center for Scientific Research “Demokritos”, Aghia Paraskevi 15310, Athens, Greece. 3The Randall Division of Cell and Molecular Biophysics and Cardiovascular Division, King's College London, Guy's Campus, SE1 1UL London, United Kingdom. 4Institute of Cell Biology, ETH Zurich Hoenggerberg, CH-8093 Zurich, Switzerland. 5Biozentrum, University of Basel, Division of Structural Biology, Klingelbergstrasse 70, CH-4056 Basel, Switzerland. The Z-disk of striated and cardiac muscle sarcomeres provides the architectural framework to assemble and anchor the largest known muscle filament systems by an extensive network of protein-protein interactions. High resolution X-ray diffraction data unravel how the N-terminus of the longest filament component, the giant muscle protein titin, is assembled into an antiparallel (2:1) sandwich complex by the Z-disk ligand telethonin. The structure provides a molecular paradigm of how major sarcomeric filaments are cross-linked, anchored, and aligned within complex cytoskeletal networks. The Z-disk of the sarcomere defines the lateral boundary of sarcomeric units within the myocyte cytoskeleton. In higher vertebrates, it anchors and aligns at least three major sarcomeric filament systems, including actin, titin, and nebulin . It also harbours a large number of smaller protein components, some of which, including α-actinin and telethonin, have been mapped to distinct binding sites at the N-terminus of titin. Their presence, proper sorting, and localization within the Z-disk region is critical for myofibril assembly and maintenance of an intact Z-disk structure. Components of the Z-disk are also involved in signalling processes that may regulate muscle development and degradation, as well as in linking contractile functions of muscle sarcomeres to membrane systems like the sarcoplasmic reticulum or the T-tubules associated with excitation-contraction coupling . X-ray data were collected at the DORIS-III storage ring beamlines BW6 and X11 at DESY, Hamburg. The project was led by a team from EMBL-Hamburg, in collaboration with scientists from King’s College in London (United Kingdom), the ETH in Zurich (Switzerland), the University of Basel (Switzerland) and the National Center for Scientific Research “Demokritos” in Athens (Greece). The very N-terminal region of titin comprises a domain topology that has been predicted to consist of two immunoglobulin (IG)-like domains, referred to as Z1 and Z2 . Co-localization studies, two-hybrid interaction screens, and pull-down assays have demonstrated that they interact with the N-terminal region of telethonin at the Z-disk periphery [3,4]. However, although the interaction with telethonin has been considered as a ‘cap’ (hence, the alternative name ‘T-cap’), or ‘bolt’ , it is not known how titin/telethonin binding affects the overall architecture of myofibrils and their associated functions. The physiological importance of this interaction has been supported by evidence linking mutations in the N-terminal regions of titin, telethonin, and the telethonin binding site of Muscle LIM Protein (MLP), to different familial forms of limb-girdle muscular dystrophy (LGMD), as well as hypertrophic and dilated cardiomyopathy (DCM). These findings, along with complementary data using animal models, suggest the existence of a link between the titin/telethonin/MLP interaction and mechanical stress sensor pathways. Depending on the specific isoform of titin, 200-700 N-terminal residues of multimeric titin filaments are located within and cross over most of the Z-disk of striated muscle sarcomeres . However, to date, no data are available on the molecular nature of the titin/titin association. Here, we have determined the crystal structure of its N-terminal region in complex with the titin binding domain of telethonin (Figure 1). Contrary to previous expectations , our data reveal an antiparallel assembly of two titin molecules mediated by telethonin, suggesting that telethonin plays a key role in titin assembly and Z-disk anchoring. In the complex, the two N-terminal IG-like domains of titin, Z1 and Z2, are in an extended conformation and are connected by a short three-residue linker. The two domains exhibit a similar structure and they are almost equally translated, generating a superhelical coil arrangement of each titin N-terminus. The second component of the complex, telethonin, forms a unique elongated structure with a central five-stranded antiparallel β-sheet that is extended by two exposed wing-shaped β-hairpin motifs. The two motifs are related by an approximate two-fold symmetry, generating a nearly perfect palindromic arrangement. The peculiar symmetry of the telethonin structure allows it to mediate titin-titin assembly. The four nearly identical titin-telethonin interfaces are formed from two intermolecular antiparallel β-sheets. The two β-sheets are separated by the telethonin core β-sheet that is flanked by the two short Z1-Z2 linkers of each sandwiching titin molecule. Taken together, the data on the titin/telethonin complex provide a novel concept exemplifying how IG-like domain–containing proteins may act as receptors for protein ligands, such as telethonin. In contrast to other IG-like receptors, the protein-protein interface of the titin/telethonin sandwich complex is formed by main chain–mediated intermolecular β-sheet interactions. In terms of general principles of complex formation of biological molecules, the titin/telethonin complex reveals an unprecedented analogy to palindromic or pseudo-palindromic protein-DNA complexes. The extensive network of interactions indicates that the N-terminus of titin, upon complex formation with telethonin, provides a rigid anchoring scaffold rather than adding to the molecular elasticity that has been observed in several titin segments . Indeed, such an anchoring structure that is resistant to external mechanical forces seems to be a prerequisite to allow elastic movements of other parts of titin, specifically within the sarcomeric I-band, under active muscle contraction/relaxation conditions, without the danger of uncontrolled disintegration. The bridging structure of telethonin suggests that it is essential for the functional integrity of the titin filament in mature myofibrils. Within the context of the Z-disk, our structure of the titin/telethonin complex provides an unexpected atomic model for the association of titin molecules at their very N-termini, suggesting that telethonin acts as a titin-titin cross-linker (Figure 2). Its molecular architecture, along with evidence from binding and imaging data in this contribution and in previous publications [3,4], indicates that binding is very tight and may even be irreversible in the absence of signals that would weaken or degrade the interaction. The temporal delay in the proper localisation of telethonin and its selective disappearance in neurogenic atrophy may suggest that telethonin turnover must be regulated, either intrasterically or by yet unknown alterations in the telethonin structure. 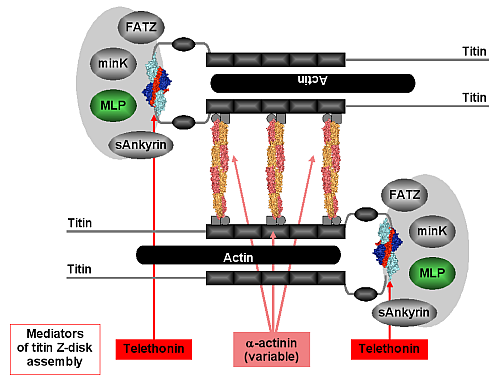 In support of this, there is accumulating evidence indicating that the observed titin/telethonin assembly may interact with other protein components that generally appear to be more mobile than titin and telethonin. By unravelling the molecular basis of telethonin-mediated titin assembly an overall picture is emerging on how the protein networks in the sarcomeric Z-disk may contribute to titin assembly and anchoring via at least two ligands (α-actinin, telethonin). This structure resists the mechanical forces generated in active muscle sarcomeres and may feed back to the Z-disk stretch sensor machinery. Our data explain how some serious hereditary muscle diseases may be associated with the disruption of molecular interactions that connect and anchor sarcomeric filaments in the Z-disk by bridging mediators. Tskhovrebova, L. & Trinick, J. Titin: properties and family relationships Nat Rev Mol Cell Biol 4, 679-89 (2003). Labeit, S. & Kolmerer, B. Titins: giant proteins in charge of muscle ultrastructure and elasticity. Science 270, 293-6 (1995). Gregorio, C. C. et al. The NH2 terminus of titin spans the Z-disc: its interaction with a novel 19-kD ligand (T-cap) is required for sarcomeric integrity. J Cell Biol 143, 1013-27 (1998). Mues, A., van der Ven, P. F., Young, P., Furst, D. O. & Gautel, M. Two immunoglobulin-like domains of the Z-disc portion of titin interact in a conformation-dependent way with telethonin. FEBS Lett 428, 111-4 (1998).